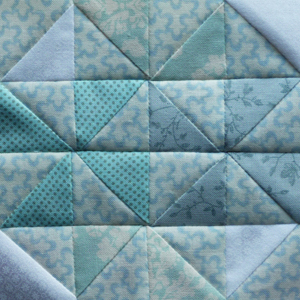 There are several blocks in the Farmer’s Wife sampler that consist entirely of half square triangles. And several of them consist of 32 half square triangles, exactly. Old Windmill is one of them. I leafed through Laurie Hird’s book and counted them all. There are 4 blocks consisting of 32 half square triangles, to be distinguished only by the different arrangement of colour or direction of the triangles: Broken Dishes, Peace & Plenty, Whirlpool, and Windblown Square. Having done this quick statistic, I now know that there is only one for me to go. I am not too happy how this block turned out. The colours are too similar in value, and the triangles’ points don’t always meet where they should. But I decided that I would not be miserable if this block goes into the sampler, so I will leave it as it is. Posted in Uncategorized and tagged farmer's wife, farmer’s wife quilt, old windmill, old windmill block, quilt, quilt block. Bookmark the permalink.